I confess to being a Pointless fan – we record the BBC tea-time quiz programmes and watch over dinner. But if I’ve been away regularly, we can be several weeks behind in catching up with the episodes. So I’m afraid we’re three weeks late in reporting that on May 9th and 10th Mr Neil MacKenzie, procurement legend, ex CPO and CIPS Board member, Atos Consulting Partner and all-round good guy starred on the show along with his very good-looking son Cameron. I almost choked on my pizza when they suddenly popped up on the screen! 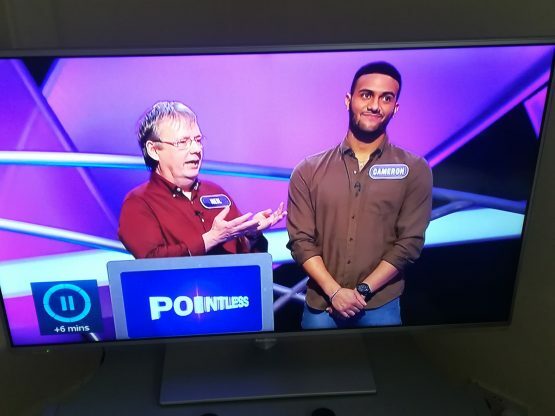 We won’t give you the outcome and spoil it in case you want to go back and find it on iPlayer catch up (don’t delay, BBC will delete it soon) but suffice to say Neil gave a stunning answer on a topic you might not have expected him to know much about! Hidden depths, we say. As I write this, President Trump has announced impose tariffs on steel and aluminium imports from allies in Europe and North America. I’m sure he knows what he is doing because let’s face it, there is no way the American people would elect an idiot, but anyway the US said a 25% tax on steel and 10% tax on aluminium from the EU, Mexico and Canada will start at midnight yesterday. The move immediately triggered vows of retaliation from Mexico and the EU, which called the tariffs "protectionism, pure and simple". Maybe the UK should slap a tariff on US music, that’s a huge import sector , I reckon that would work. Problem is the Reading / Leeds Festival headliners are Fall Out Boy, Panic At The Disco, Kendrik Lamar, and Kings of Leon - ALL of them US acts, a selection that was disappointing for UK music to say the least. So that might be a bit of a problem there I suppose ... more on Metal Miner anyway on the real issues. The Healthcare Supplies Association is hosting its summer event in Solihull on June 21st. It’s not quite such a huge event as the autumn annual conference, but with the rapid pace of change in NHS procurement, this year’s summer event holds greater importance for the community. The new “category towers” and “future operating model” structures are now into implementation phase, and other initiatives such as the “nationally contracted products” are changing the landscape. So I’m delighted to say I’ve been invited to speak and will be there on the 21st. I’m going to take a positive stance and focus on some of the critical success factors for the new model, in terms of both the central bodies and Trust procurement leaders. Whilst I do still have some concerns about the future, I’m sure there are approaches that will increase the chances of success for NHS procurement generally. Back to Neil and Cameron Mackenzie – Neil told the audience that he is a vexillologist (someone interested in flags). The best bit of their appearance was his son’s expression as Neil got into a description of the flag of Martinique, the most “exciting” flag in the world, as he said. Do you get the impression Cameron might have heard that story before? Just the odd 50 times or so … ? We won’t give you the full (and rather sad) back story to Tracyanne Campbell (ex Camera Obscura) and her new venture, Tracyanne and Danny, but Metacritic ratings (an impressive 87 currently) drew my attention to their rather lovely eponymous debut album, full of retro early 60s styled pop, country and soul, like this.